Also, could you please explain if I am right to think the “compass” means to direct the FORCE of people to the RIGHT direction? If so, could you please explain the FORCE as well? Wow. You’re so completely incorrect that it makes me wonder if you’re a Mason at all. The square isn’t a “square.” It’s a measuring device. It looks a whole lot like an “L” and nothing like a “square.” It looks like a carpenter (or mason’s … ) measuring device. 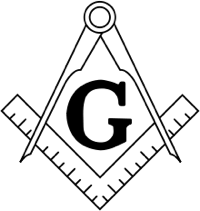 It’s used ot make certain that an angle is “true.” In Freemasonry, it symbolizes virtue. It’s used to govern one’s actions and interactions with mankind. It represents honesty, fairness, and virtue. 1. It’s not a square. There are no people in the square. 2. If “square” means boundary to you, you probably aren’t a Freemason, because you’d know EXACTLY what a square is. To correct your misconceptions about the “compass.” It’s not a “compass” it’s “compasses.” A compass is used primarily for navigation. Compasses are a tool used for inscribing circles or arcs, or – used as dividers – to measure distances. If you visualize a pair of compasses with points spread wide apart – like they would be if they were going to be used to draw a circle, for instance – it’s said that the tenets of Freemasonry (friendship, morality, brotherly love) are contained between the two points. So, to address your request for explanation about whether you’re “right” … no, you’re not right. You’re not even close. There’s no “force” at all. Perhaps, if you’re truly interested in Freemasonry, you should pick up a copy of “Freemasons for Dummies” by Christopher Hodapp and a copy of “The Complete Idiot’s Guide to Freemasonry” by S. Brent Morris. Then, when you’ve finished both books, you should head down to your local Masonic Lodge and talked to some of the members. If you like what you hear, think about picking up an application and consider joining the fraternity.